Where do I use my Buymobiles.net voucher code? Head over to your basket and scroll down to 'Do you have a promo code?'. Click 'Go To Secure Checkout' to continue with your order. 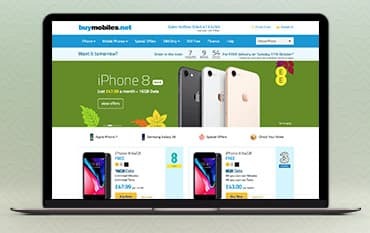 Buymobiles.net, the online-only outfit, avoids unnecessary overheads by cutting out the middleman, bringing consumers great savings and discounted mobile phone plans. Buy Mobiles have a variety of low-cost, affordable pay monthly smartphones to choose from if you’re looking to upgrade or get a new mobile phone contract. And to make sure you get the tariff that’s right for you, you can compare these mobile phones from two of the UK’s biggest networks: EE and Three. Whether you’re looking for the best iPhone deals, fantastic Samsung Galaxy offers, or anything else, Buy Mobiles have a range all of the most popular smartphones, from the best manufacturers for you to choose from. And with exclusively trained tech experts and great customer service available via phone, email and even social media, you can place trust in Buy Mobiles to bring you, not only the best deal but exceptional help and support too. Enjoy instant savings via the special offers section on the Buy Mobiles website. In this section, you’ll not only discover affordable contracts and low-cost mobile plans, you’ll also find free handsets and limited time only deals. You can keep up to date with these regular sales and discounts by signing up to the buymobiles.net newsletter, which notifies you on all upcoming promotions first. You can also check out our voucher codes and discounts to save even more money on your mobile phone contract or device. At Buy Mobiles you’ll find all the iPhone models that are currently in production, with everything from the old classics like the 5s to the newest designs and handsets like the 8 Plus. Being one of the most impressive and advanced smartphones, the iPhone section is always popular, offering a plethora of iPhones via different mobile plans including pay monthly, pay as you go and SIM only. Whatever you go for, you get to enjoy free next-day delivery on all your orders as well as great allowances on your minutes, texts and data for affordable prices and low upfront costs. Keep your number and stay on the same network with your new iPhone and even enjoy cashback on certain plans. Enjoy the best mobile phones on contract, for affordable prices. If you’re only interested in mobile phones on contract then take a look at Buy Mobiles best-selling contract mobile deals and fantastic monthly price plans. They have the latest smartphones from Apple and Samsung, including the iPhone 8 and Samsung Galaxy S8, as well as many more mobile phones on contract from great brands like Sony and HTC. Choose an affordable deal on either Three or EE and benefit from free next-day delivery. For advice on choosing the most affordable contract and getting the most value for money head to the buymobiles.net blog. Here you’ll find news on the latest apps and phone launches, as well as reviews on what’s new and hot. Next Day Delivery is free on all orders (there’s no delivery on Sundays). You can return your purchase from Buy Mobiles within 14 days of receipt to receive an exchange or refund. The item must be in its original condition and packaging, with locks and passwords removed and the phone restored to factory settings. To arrange the return of your phone, please call 0345 413 6200 and then send the product back, including a covering note identifying reasons for return. With an extensive range of handsets available from Apple, Samsung, Sony, HTC and much more, buymobiles.net is the place to come for an upgrade on your mobile phone. With the best prices available on both EE and Three networks and many free gifts available as part of their packages, Buy Mobiles is the ideal place for affordable contracts and devices. Whether you are looking for a Pay Monthly, Pay as you go or Sim Only Deal, a buymobiles.net discount code can cut the cost of your current deal while upgrading your handset.